A portable lock designed to hang on hardware fittings. AKA Pad Lock. In a Pad Lock the body of the lock extends up the sides of the lock to add further protection to the shackle. The "D" shaped moving part of the lock. Made out of high strength alloys to resist cutting. Not sure if this is just a European phenomenon. but it is the only place that I have seen it. So here we have the railing of a bridge across the Seine in Paris. 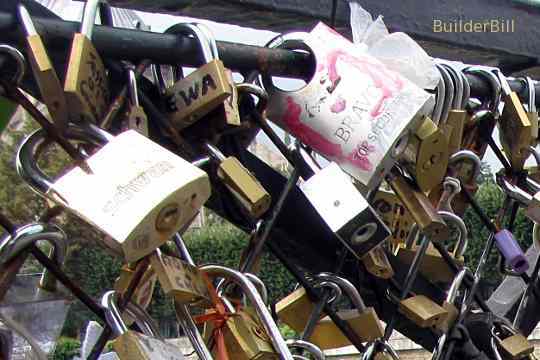 The deal is that couples swear their undying love, sign the lock and throw the key into the river. Gotta be a brilliant marketing ploy by the lock industry. There would be thousands on this one bridge. Anyway, back to business... just a few different shapes and sizes of padlocks. The locks are nothing like the old medieval lock on the door locks page with a keyhole in the face, but they all have a cylinder system that has the key being used on the bottom face of the lock. page. Pad locks can't do anything at all without another piece of gear. It could be a simple steel chain looped through two leaves of a steel gate or as we see here a Hasp and Staple fitting. 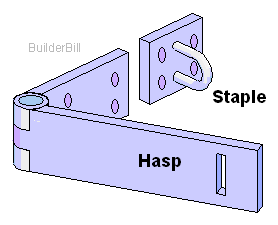 All hasp and staple fittings are not created equal. Some of them are very flimsy and can just about be broken with a nail file. Above is my Idea of what I would be looking for in one of these. First and foremost it has to be just as strong as the lock. What is the point of using an expensive lock if the staple can be cut through with a junior hacksaw in two minutes? Most serious Hasp & Staples cover the fixing screws or bolt heads like this one. I go for the belt and braces approach in cases like this, I don't use screws if possible but try to get bolts through the door and the jamb if possible. If you HAVE to use a fitting that shows the bolt heads then do this. Where they come though at the back, cut the bolts off leaving a couple of threads proud of the nuts and rivet them over. A few belts with a hammer will make sure that the nuts won't undo now matter how long the bad boys might turn them. 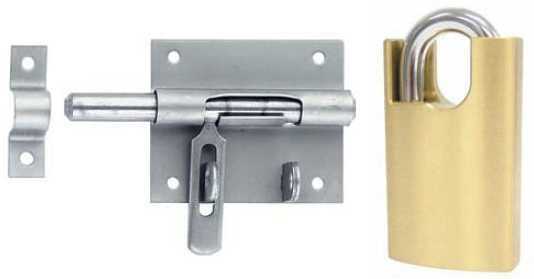 The pad-bolt uses a hasp and staple system with the hasp fixed to the bolt. The lock next to it has what is known as Shackle Protection. You can see that it would be a lot more difficult to get bolt cutters or a grinder into the shackle area to try to cut it. Bolt cutters that are small enough to get into position when the lock is in use would probably have no chance in cutting the shackle anyway. They are always made out of toughened steel, and this particularly one is made out of a Boron Alloy. The body is brass.